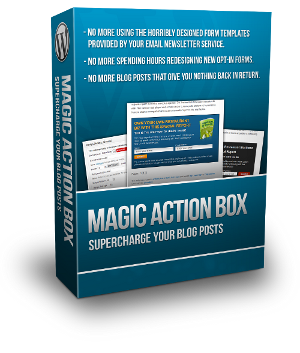 Thanks for your interest in being an affiliate for Magic Action Box! Here are some images that you can use for your blogs to help promote the plugin. Make sure to use your affiliate link with them! If you own a blog, I am sure you know that one of the most important things is to have a great email opt-in that helps you to get qualified individuals on your list that can benefit from what you have to sell. Well, the problem with most marketing services that allow you to create opt-in forms for your email campaigns is that the forms usually look horrible. Plus, they usually take so long to create so you typically only have one generic formon your blog. What a pain… that means you have hundreds of posts that are going to waste. 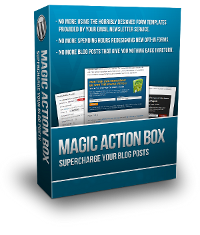 Well, this cool little plugin will make each and every post become a sales machine. 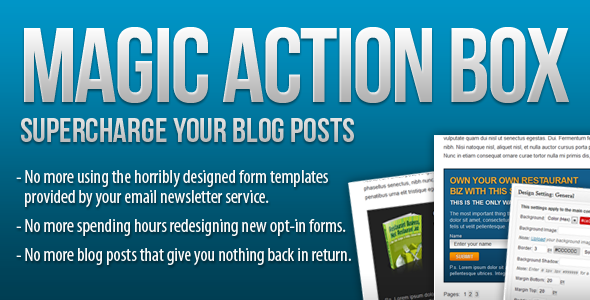 In essence, you can quickly make beautiful opt-in forms for ANY email direct marketing service in less than 5 mintues and have them be specific to the context of your post. That’s right… your post literally qualifies your prospects!